SAM-ICE is a JTAG emulator designed for SAMA5, SAM3, SAM4, SAM7 and SAM9 ARM® core-based MCUs and MPUs, including Thumb mode. It supports download speeds up to 720K Bytes per second and maximum JTAG speeds up to 12 MHZ. It also supports Serial Wire Debug (SWD) and Serial Wire Viewer (SWV) from SAM-ICE hardware V6. BNO055 Xplained Pro is an extension with the Bosch BNO055 Intelligent 9-axis absolute orientation sensor and a RGB LED. It connects to the extension headers of any Xplained Pro evaluation kit. The ATBNO055-XPRO extension kit does not include a Xplained Pro evaluation kit. The ATBTLC1000-XPRO-ADPT is an adapter board for the ATBTLC1000-XPRO expansion board. It is required for the UART hardware flow control functionality to operate correctly when the ATBTLC1000-XPRO expansion board is connected to certain Xplained MCU base boards. Ethernet1 Xplained Pro is an extension board in the Xplained Pro evaluation platform. The board enables the user to experiment with Ethernet network connectivity applications. QT1 Xplained Pro kit is an extension kit that enables evaluation of self- and mutual capacitance mode using the Peripheral Touch Controller(PTC). The kit shows how easy it is to design a capacitive touch board solution using the PTC without the need for any external components. The kit includes two boards, one using self-capacitance and one using mutual capacitance. QT3 Xplained Pro is a QTouch keypad extension board demonstrating an ultra-low power keypad design using the Peripheral Touch Controller (PTC). Utilizing the PTCs low power capabilities it enables markets lowest power wake-up on touch. Note: QT3 Xplained Pro requires a compatible Xplained Pro evaluation kit. See the Related Tools tab for supported models. The QT4 Xplained Pro kit is an extension board that enables evaluation of self-capacitance Touch and Proximity sensors using the Peripheral Touch Controller (PTC). The kit shows how easy it is to design a capacitive touch board solution using the PTC without the need for any external components. The SAM D20 Xplained Pro evaluation kit is ideal for evaluation and prototyping with the SAM D20 Cortex®-M0+ processor-based microcontrollers. Xplained Pro Extension kits compatible with the SAM D20 Xplained Pro kit can be purchased individually. The ATSAMD20-XPRO evaluation kit does not include extension boards. The ATSAMD21E16LMOTOR is an MCU card for Motor control starter kit - ATSAMxxxBDLCxxx-STK. 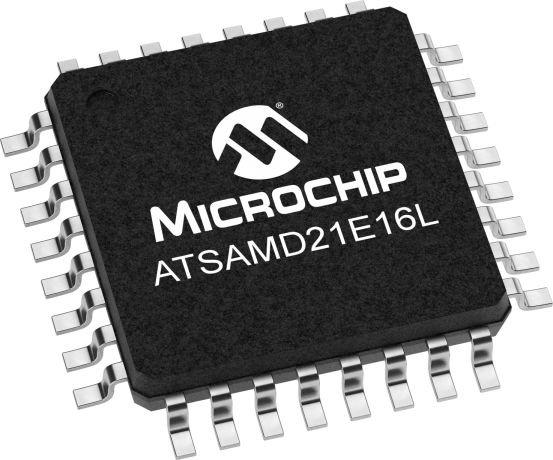 The hardware has the SMART ARM based MCU, ATSAMD21E16L, with integrated on-board debug support. The MCU card can be directly used with the currently available ATSAMD21BLDC24V-STK, a low voltage BLDC, PMSM motor control starter kit. The SAM D21 Xplained Pro evaluation kit is ideal for evaluating and prototyping with the SAM D21 ARM® Cortex®-M0+ based microcontrollers. Xplained Pro Extension kits compatible with SAM D21 Xplained Pro can be purchased individually. The ATSAMD21-XPRO evaluation kit does not include extension boards. The SAM DA1 Xplained Pro evaluation kit is ideal for evaluating and prototyping with the SAM DA1 ARM® Cortex®-M0+ based microcontrollers. Extension boards to the SAM DA1 Xplained Pro can be purchased individually. The ATSAMDA1-XPRO evaluation kit does not include extension boards. SLCD1 Xplained Pro is an extension kit with a 96-segment LCD display. It connects to Xplained Pro evaluation kits with segment LCD extension headers. For supported kits, see the related tools tab. Routing card for SAM D20 in 64-pin TQFP and QFN socket supplements the STK600 Starter Kit. Routing card for SAM D20 in 48-pin TQFP and QFN socket. Supplements the STK600 Starter Kit. Routing card for SAM D20 in 32-pin TQFP and QFN socket. Supplements the STK600 Starter Kit. Routing card for SAM D21 in 64-pin TQFP and QFN socket. Supplements the STK600 Starter Kit. Routing card for SAM D21 in 48-pin TQFP and QFN socket. Supplements the STK600 Starter Kit. Routing card for SAM D21 in 32-pin TQFP and QFN socket. Supplements the STK600 Starter Kit. Routing card for SAM D10/11 in 24-pin QFN socket. Supplements the STK600 Starter Kit. Routing card for SAM D21L in 32-pin QFN or TQFP socket. Supplements the STK600 Starter Kit. Socket card for 32-pins QFN 0.5 mm pitch devices. Supplements the STK600 Starter Kit. Generic socket card for 24-pins QFN 0.5 mm pitch devices. Supplements the STK600 Starter Kit.